Thanks to FH Weddings & Events, the Kapok Gardens and Pavilion looked amazing this past Sunday afternoon for Samantha and Vincent’s wedding and reception! Samantha also looked radiant as she was escorted by her father down the aisle to join Vincent where, in front of their family and friends, the couple shared their vows, exchanged rings, and were pronounced husband and wife by Rev. 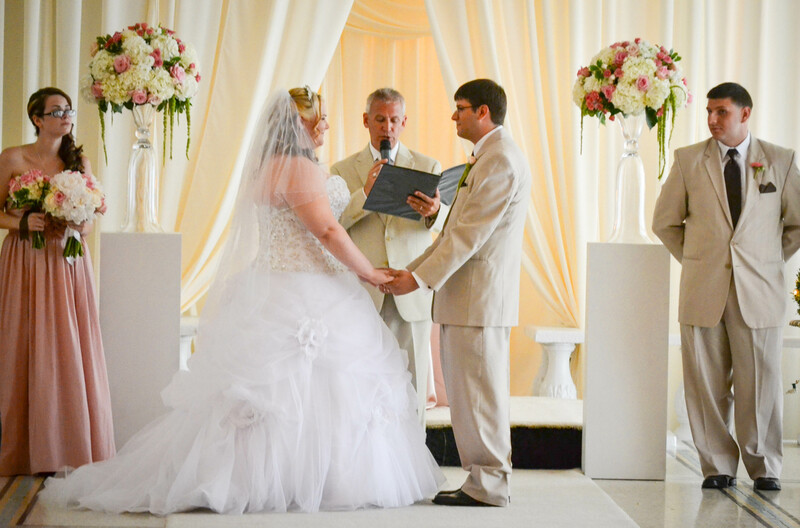 Rick Lackore of Sensational Ceremonies, LLC . Ceremony Music, Sound and DJ by James King with Grant Hemond and Associates, Inc.; Linens, florals and décor by FH Wedding & Events; Chiavari Chairs by Signature Event Rentals www.TampaEventRentals.com ; Catering by Amici’s Catered Cuisine, Inc.; Wedding Cake by A Piece of Cake and More; and venue coordination by Nancy Hall, General Manager of Kapok Gardens and Pavilion all under the coordination of Lead Planner and Designer, Julie Perez of Chic Designs & Fabulous Events. This picture was provided by Tammy Lackore. Congratulations to the new Mr. and Mrs. Vincent Manza!